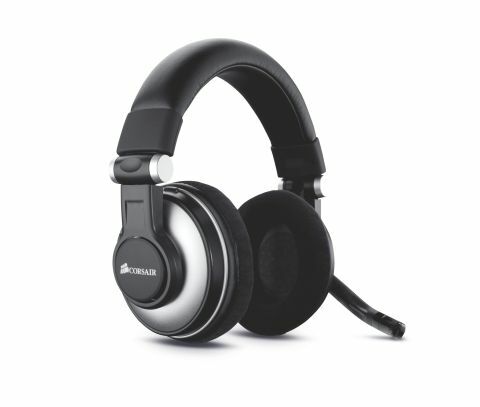 Can Corsair muscle in on Sennheiser's headphone territory? If you're familiar with Corsair, it'll be because you're the type of person that likes to open up their PC and fiddle. A well-respected brand for memory, power supplies, solid state hard drives and USB keys, Corsair isn't a name that you'd normally associate with audio. That's because the HS1 is the first headset that Corsair has ever designed. Don't think for a moment that the HS1 isn't still quite techie, though. It's pitched directly at demanding gamers with its large, 50mm stereo drivers and support for Dolby Headphone surround effects, while a swinging boom on the right contains a unidirectional condenser mic to pick up your desperate calls for more DOTs. As impressive as the spec sheets for the HS1 look, this sort of price point isn't for the faint-hearted. It's inhabited by highly established names such as Sennheiser, Logitech and Steelseries. Has Corsair got what it takes to compete?